Doing away with wires has been a continuing trend for over a decade. From radios, TVs, and mobile phones to today’s Wi-Fi and Bluetooth technology, just about every gadget we use is doing wireless. Portable media players such as the iPod and Zune offer the freedom of taking our music anywhere, however headphones still keep us tied down. However with Altec-Lansing’s BackBeat Bluetooth Wireless Headphones, the future closer than ever. Most smart phones such as the Apple iPhone, Palm Pre, and RIM BlackBerry all support the technology. Bluetooth Headphones aren’t entirely new, we reviewed the Kensington Bluetooth Stereo Headphones over a year ago, but there a few issues with it. They were bulky, sounded mediocre, and uncomfortable. On the other hand, the BackBeat 903 headphones are lightweight, offer a great battery life, and sound great. The BackBeat 903 headphones weigh 34 grams and rest behind the ear when worn. An 8 inch cable connects the two pieces together behind the neck. The ear pieces are slightly adjustable, allowing extending vertically and sniveling horizontally. There are a call and a play buttons on the left and right ear bud, respectively. 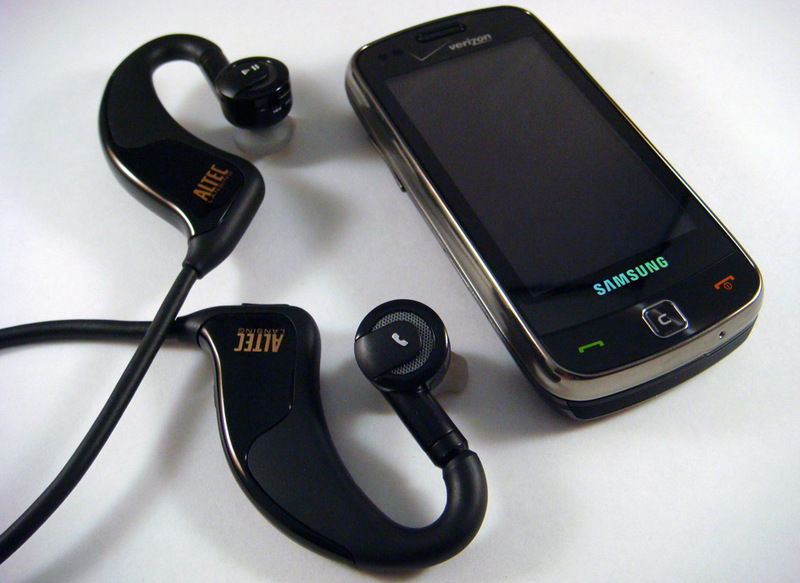 A volume switch, which also controls track navigation, is under the right ear piece. The power button and standard micro-USB charging port are on the left ear piece. The headphones fit and felt a lot better than both the Kensington Wireless Headphones and the Motorola S9. They still don’t come anywhere close to the comfort a traditional pair of ear buds or over-the-ear headphones offer. These tended to slide off quickly with too much physical movement. Even with adjustments, these just wouldn’t work for me if I were to go for a jog, but would work just fine in an office room situation. To give these a second chance, I asked a couple of friends to give them a try. Just about all of them had no complains about the fit and were overwhelmed by the truly wireless headphone technology. In fact, they wanted to buy a pair too. 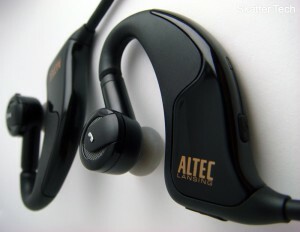 Altec Lansing implemented the ability to use these as a Bluetooth Headset as well as streaming music. The built in microphone sounded crystal clear to those on the other end of the phone. I actually found it to sound better than the expensive Andrea BT200 headset that we previously reviewed. The call button ends calls during an active conversation; answers call waiting and can start voice commands. 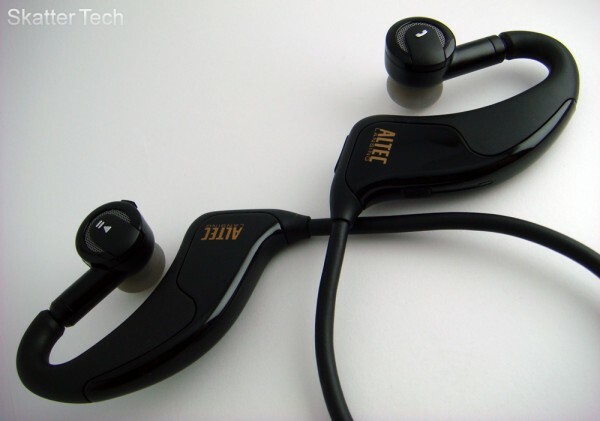 The one feature the BackBeat lacks, that I would have truly appreciated, would be dual pairing. Things would have been a lot more convenient if it allowed me to stay paired to both my phone to answer calls and to my laptop for music. I’ll currently have to re-pair each time I switch between the devices. If you’ve got the fairly new Laptop or Smart Phone sporting Bluetooth 2.1 with stereo profile support, these will probably function just fine. I tested mine with the Dell XPS M1530 Laptop running Windows 7, which paired easily and sounded fairly good. There were occasionally jitters, which wasn’t a big deal. I also attempted to pair it with my Apple iMac, it ended up partially bricking the BackBeat. I had to hold down the power and plug in the charger to reset it. I further went on to test it with the Apple iPhone 3GS, which paired quickly and sounded a whole lot better than music did through my laptop. (It was most likely due to the poor quality of the Bluetooth Module in the XPS.) Even with the latest iPhone 3.1 OS, the previous/next track function doesn’t work due to the lack of the remote control profile support on the device. Hopefully Apple will do something about that soon; it can at least pause and play for now. The remote control function did work with the LG enV Touch and the Samsung Rouge. 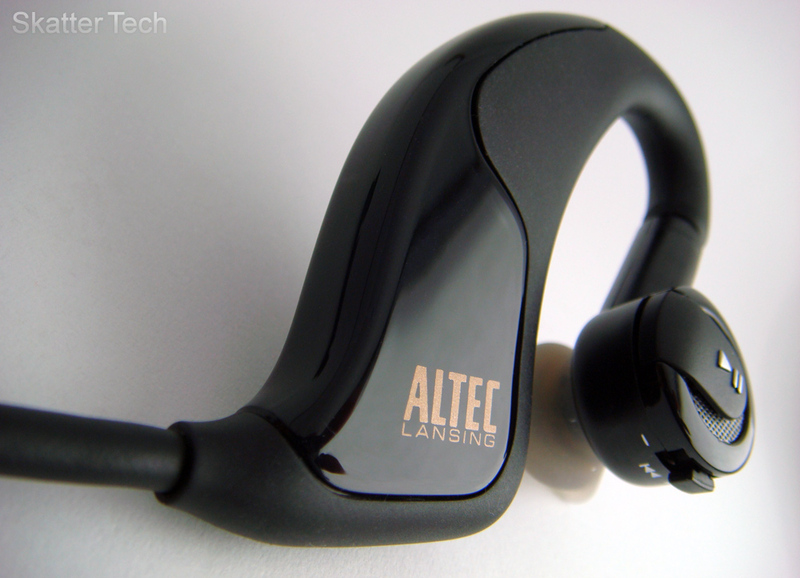 The bottom line is Altec-Lansing’s technology works; however your device might not support the standard. Before picking these up, read up as to whether your device is compatible with the BackBeat. Altec-Lansing also sells a simple headphone jack to Bluetooth adapter, if you wish to use this with a device that isn’t’ compatible. Before anyone goes crazy over the rating for this, read this entire paragraph first. As I stated in the intro, these are a step closer to the future, but not yet there. That’s mainly because the sound quality is great, but only great compared to the few Bluetooth Stereo Headphones on the market. These won’t compare with the sound quality offered by Sennheiser, Shure, Ultimate Ears, or V-Moda for the same price. But don’t let that stop you from purchasing these. The average person will probably listen to music from ripped CDs encoded in MP3 or from an online music store such as iTunes or Amazon MP3. With that kept in mind, most will probably not be able to differentiate the quality between a decent pair of headphones and these, especially when fascinated by the freedom offered by the wireless aspect. So yes, for the Bluetooth Headphones I’ve come across so far, these probably one of the best. I tested these after a full charge. Instead of one unlikely straight drain, I decided to test real life performance. I used it for 30 minutes at a time and turned them off while not in use. I used iTunes to track the songs I had played on my iPhone. When the headphones started beeping to let me know it was at its last throws, I had played back about 5 hours of songs on my phone over the course of two weeks. If you throw in the hour or so of phone calls I may have answered with these, it’s pretty decent. They weren’t too short ranged either. If there are no obstructions such as walls, music kept playing from my iPhone from at least 75 feet or so. In the average household, it can probably make it through a wall or two before quality degrades heavily. The packaging is minimal and clean. Getting the headphones out was quick. There’s literally nothing included in the box other than the AC Adapter, Bluetooth Headset, and a manual. Which is great due to simplicity. I do wish that Altec Lansing would have thrown in a USB to microUSB cable to allow charging the BackBeat 903 with laptops and USB chargers when a power outlet isn’t available. The BackBeat 903 headphones are a unique piece of gadgetry that just about any individual will notice. It truly does stand out. They offer the freedom to easily move away from your desktop or laptop. The technology works, it’s easy to setup, and use. The battery lasts for well over an average day’s use. Plus you can use them to answer calls conveniently. The only drawback would be the audio quality, which still lacks compared to traditional headphones. I enjoyed using these and would definitely recommend these. It’s available now for a fairly reasonable price of $55 through retailers such as Amazon.com. with the original rubber earbuds,the sound quality is,like you said,very poor.so what i did is i took two in-ear silicon buds from a pair of cheap headphones,replaced the original rubber earpieces with these and,voila!…paired with a samsung d980 with the equalizer set to “rock”,and with the bass boost on the 906 on,sound quality improved by leaps and bounds.now the audio on my back beat 906 is totally awesome.